Molded grating is manufactured by our skilled worker through manual hand lay-up in an open, heated steel mold. Continuous fiberglass roving is laid in the mold in alternating layers and thoroughly wetted out with vinyl ester or polyester resin. This continuous process constructs a one piece panel that offers excellent corrosion resistance and bidirectional strength in both bearing and cross bars. This process involves constant monitoring of temperature control and curing cycle. When the panel naturally cured, the surface shall have a concave surface for slip resistance. A standard grit surface is made through a secondary operation by bonding grit to the grating panel. 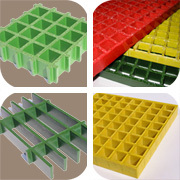 If the grating is to have embedded grit, the grit shall be applied during the curing cycle before the panel ejected from the mold.